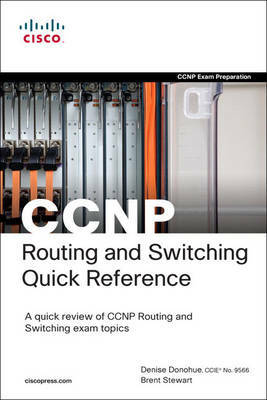 As a final preparation tool providing a review of CCNP exam topics, the CCNP Quick Reference 2/e complements official Cisco curriculum, other books, or other exam preparatory material in a candidates preparation for the four CCNP exams. This concise guide provides you with detailed, graphical-based information, highlighting only the key topics on the latest CCNP exams in a review-style format. This fact-filled Quick Reference allows you to get all-important information at a glance, helping you to focus your study on areas of weakness and to enhance memory retention of important concepts. This book provides a comprehensive final review for candidates taking any of the CCNP exams. It steps through exam objectives one-by-one, providing concise and accurate review for all topics. Using this book, you will be able to easily and effectively review test objectives without having to wade through numerous books and documents for relevant content for final review. Denise Donohue, CCIE No. 9566, is a senior solutions architect for ePlus Technology, a Cisco Gold partner. She works as a consulting engineer, designing networks for ePlus' customers. Prior to this role, she was a systems engineer for the data consulting arm of SBC/AT&T. She has co-authored several Cisco Press books in the areas of route/switch and voice. Denise has worked as a Cisco instructor and course director for Global Knowledge and was a network consultant for many years. Her areas of specialization include route/switch, voice, and data center. Brent Stewart, CCNP (R), CCDP (R), CCSI, MCSE, is the manager of Connectivity Services at CommScope. He is responsible for designing and managing a largescale worldwide voice, video, and data network. Previously he was a course director for Global Knowledge and participated in the development of BSCI with Cisco and has written and taught extensively on CCNA (R) and CCNP. Brent lives in Hickory, NC, with his beautiful wife, Karen, and their mischievous children Benjamin, Kaitlyn, Madelyn, and William.